It was such a relief to finally get my website up online after so long working on it. I realised I haven’t had a day off this year so when my other half said he had Monday off this week, I thought I would take the extravagance of an afternoon off and go with him to an exhibition. 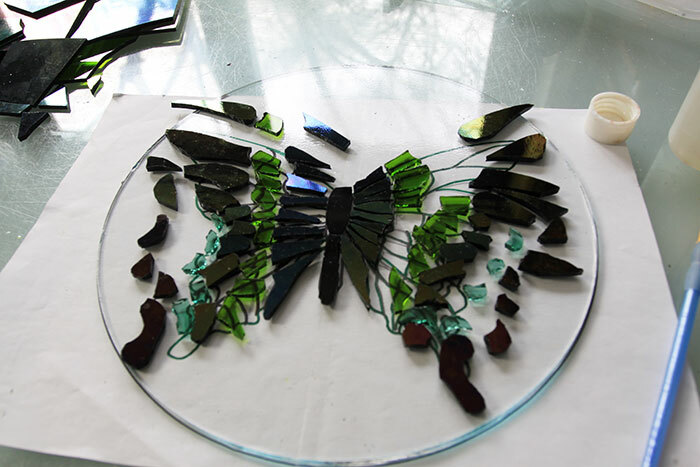 I didn’t manage to finish the butterfly bowl that I had started that morning, so it got left in pieces on my lightbox and, pretty much as we hopped on the bus, we blindly chose to see the Barbican’s latest show Magnificent Obsessions: The Artist as Collector. As we stood in the entrance foyer of the gallery being divested of our bags, coats and mobiles (strictly no photography permitted) I peered in and spotted Damien Hirst’s Last Kingdom across the vast gallery space. 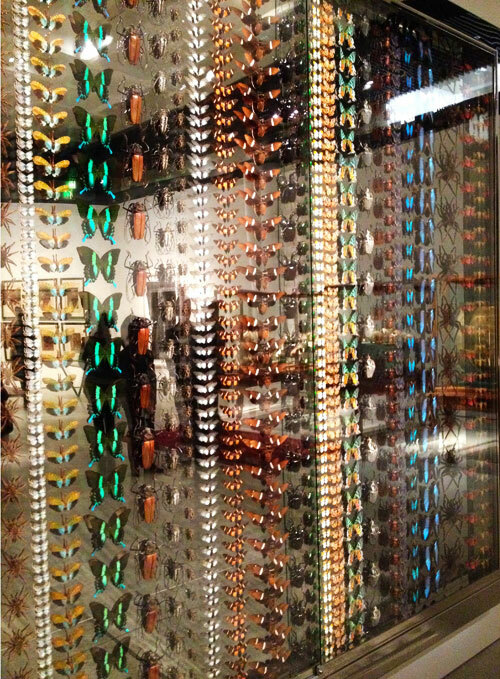 Mesmerised by the hypnotic coloured lines of almost artificial-looking insects, my husband practically tripped over the velvet rope and toppled dangerously close to the glass vitrine. Meanwhile my heart was beating a little faster for other reasons; there, amongst the entomological concatenation, was a perfect column of pristine Green Swallowtails – the exact same butterfly I had been working on that morning. Damn that Damien! I do so want to hate Damien Hirst’s work for its shameless commercialism, but I am nevertheless seduced every time by his sumptuous decorative sensibility. 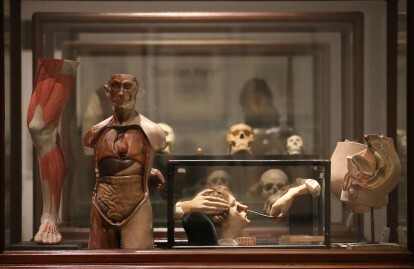 Anyway the display of Hirst’s work alongside some of his personal collection of taxidermy and historical anatomical models was the perfect demonstration of how an artist’s collection can influence and inform his work and it set the tone for this exhibition. The two expansive spaces of the Barbican Gallery had been divided into sections for each of the fourteen artists selected for their collecting proclivities. 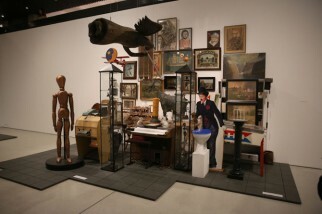 As we moved from space to space this multitude of objects, all artfully arranged with the heavy hand of the curator evident, started to coalesce in my mind into two categories – objects that spoke to me and objects that didn’t. 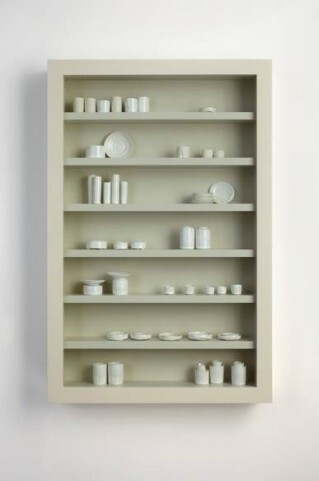 I had some insight into this while looking at Hanne Darboven’s eclectic collection of items. Divorced from their natural habitat in her Hamburg studio where one might have had some sense of how the objects related to the space and the light there, they seemed to sit uneasily on a demarcated patch on the vast floor of the gallery. 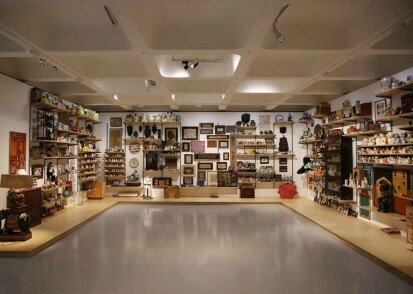 A German conceptual artist, Darboven had many objects which just screamed junk shop at me, but there were one or two which immediately struck a chord with me and seemed to be plucked directly from my own childhood holidays spent with the German side of my family. 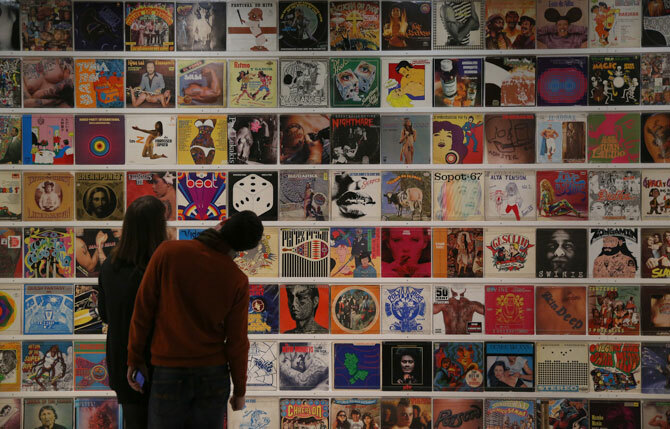 As we walked through the room dedicated to the record collection of the Mexican artist and tattooist Dr Lakra, we giggled at some of the outrageous album covers which flaunted the misogyny of 1970s rock with its naked ladies. I reflected that this room would have appealed to our Designed | Crafted artist Catriona Faulkner who is inspired by Mexican influences and tattoos and also describes herself as a collector. 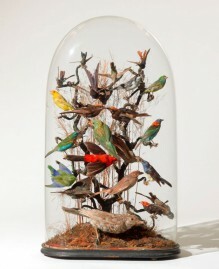 My co-curator and fellow glass artist Brett Manley is also an avid collector – her home is bursting with objects she has amassed over the years, and even her car dashboard is covered with a display of dozens of little ceramic figurines. As we ascended to the upper level, we came upon a room of hundreds of similar ceramic figurines, collected by artist Martin Wong and his mother in her garage and then brought together as an art piece after his death by an admirer and fellow artist Danh Vo. 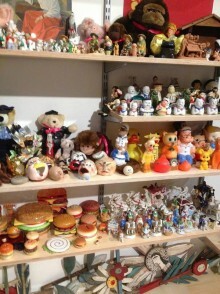 The sheer scope and magnitude of the collection belied the apparently trivial nature of its individual pieces which were the kind of mass produced kitsch I remember from my childhood – Disney characters, ceramic hamburgers, waving Oriental cats. 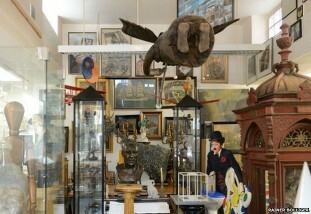 What was it about collecting so much cheap souvenir-shop stock that brought the artist and his mother such enjoyment? All I could think was how much dusting would be involved! For me, the value in these kind of nostalgic objects which take me back to my childhood would be lost if I was surrounded by them everyday. I was thinking about our connections to objects so naturally Edmund de Waal was very much in my mind and then, there we were in a section devoted to him and his collections – found objects he had collected as a child, inherited objects he had researched as a young adult and of course objects made by his own hand as a mature artist. 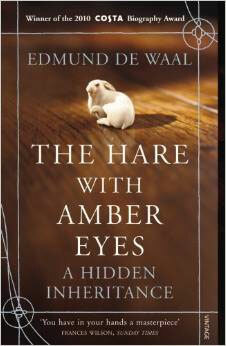 I read De Waal’s wonderful book The Hare with the Amber Eyes several years ago which charted his family history back through different centuries and different countries by way of following the trail of inheritance of a collection of Japanese netsuke from generation to generation. 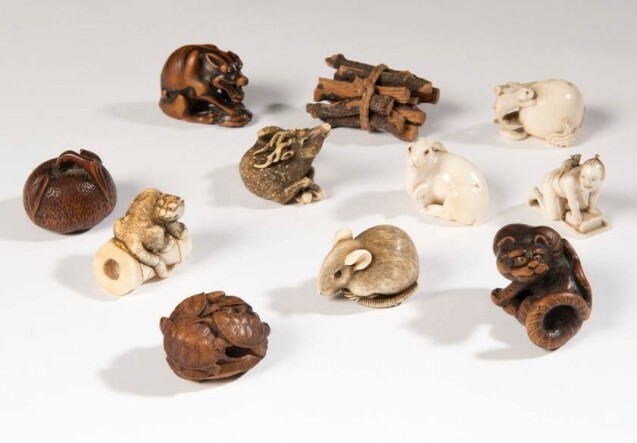 On display were some of these netsuke, small sculpted objects which served both functional and aesthetic purposes as part of the traditional Japanese kimono. It was amazing to see some of these objects which he had so beautifully described in his book and I felt a connection to them, imbued simply because of my knowledge of what these meant to him and his family. I found the show unexpectedly thought provoking, and whilst we had wandered in not knowing what to expect, on my way out I asked for the show programme to have something to read on the train home and as a reminder of the exhibition. I was told there was none and that all the information about the show was on an app that one could download. How ironic, that after this carefully curated exploration of the importance of collecting objects, the closest one could get to a keepsake of the show was an audio trace somewhere in the digital ether! Thank you for the item on Artist as a collector. The 6th form are looking at objects, part of the AS unit 2. The last time I saw you, I had a group of yr 11 boys crammed into your studio. There were only 14 then. Unfortunately, class sizes have gone up. I have followed you over the years and watched your work and website with admiration and pleasure. I will be coming along to the Dulwich craft fair, I hope to see you there. Yes, I do remember! Having fourteen lads crowded into my studio was a memorable experience! I am about to do another project with a local school, though this time an infants’ school. I look forward to seeing you again during the Dulwich Festival. Hi Wendy, this might be a bit random and you might not remember me but i was one of your students at St Josephs back around 2005-2009, I tried to look for you online by searching your name and this was the only page i could find, if you have a moment i would really appreciate if you could get in touch so that i could thank you and find out how everything is going for you! your help and patience helped me so much during those years and things are really going well for me now currently studying at Arts University Bournemouth!